1. Open the license file. It will be opened in Outline for Mac and the license will be activated. 2. 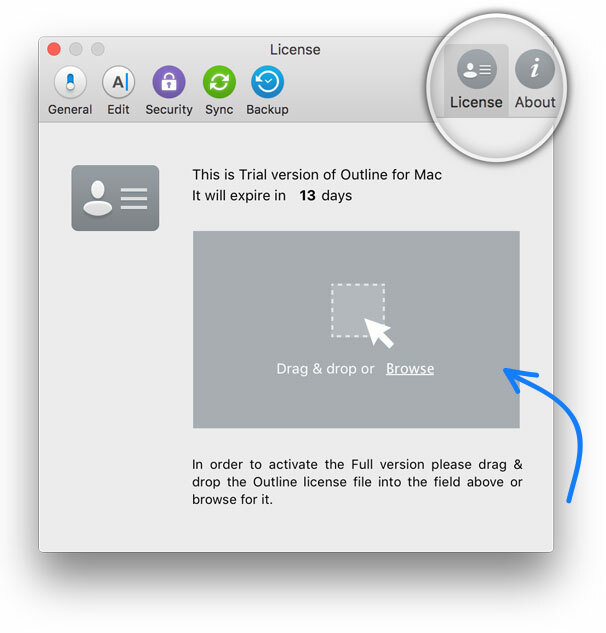 In Outline open Preferences -> License, then drag and drop your license file into the special area. 3. Rename your license file to ".license.outlinelicense" (please note that dot at the beginning is not a typo) and copy it to ~/Library/Outline/. We wish you awesome experience with Outline for Mac! Our team perfectly realizes that everyone and everything in this world needs constant improvement, and we are eager to know what you would like to see in the future versions of the app. Please share your thoughts with us using our support desk, Twitter or Facebook. We appreciate your feedback and take it into account while developing the app.